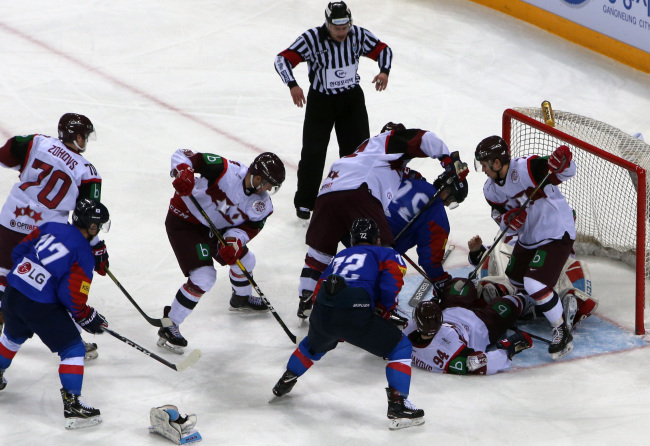 South Korea lost to Latvia 6-2 in the opening match of a men's ice hockey tournament at home on Wednesday, after blowing a pair of first-period leads. South Korea is hosting the Legacy Cup at Gangneung Hockey Centre in Gangneung, 230 kilometers east of Seoul, through Friday. The tournament, which also features Kazakhstan and Japan, celebrates the first anniversary of the 2018 PyeongChang Winter Olympics. Gangneung Hockey Centre was one of two hockey venues during the Olympics and hosted the men's and women's gold medal games. Coached by former National Hockey League defenseman Jim Paek, South Korea lost all four matches it played at Gangneung during the Olympics.